The trade-off among these methods involve quality, time, and price. As the old saying goes, you can generally pick two. In order to get all three, you’re going to need to become an ebook maven yourself, which will take a fair amount of time, but which will allow you to control all of the variables yourself. Let’s look at the options, and you can see whether that’s the road you want to take. 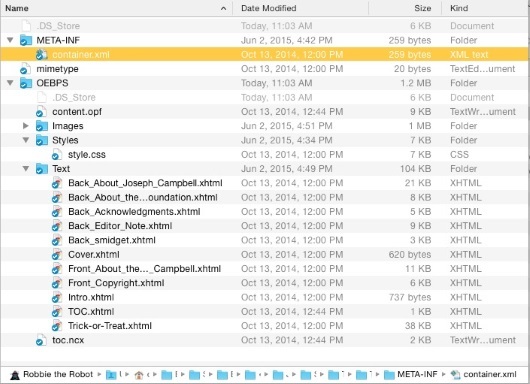 Those files and folders are Joseph Campbell’s Myths to Live By — unpacked. Most of these files — the .xhtml files (a.k.a. web pages) and .css (a.k.a. stylesheet) file — are just what you’d find if you looked at the files building a fairly straightforward website. The toc.ncx file is a specialized navigation file; it contains the information that your ereader displays when you click on the contents or chapters button. You can create all of this from scratch using text-editing software, or XML editing software, or a web-page editing app like Adobe Dreamweaver. I don’t recommend it. The amount of labor involved is huge, and the places where you can make mistakes are many; computers are literal-minded, and a missing space or semi-colon that the human eye would fix without our even being aware of it will break an ebook. 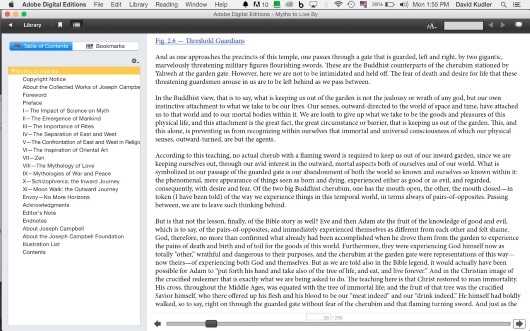 However, it is possible to use those apps to edit an ebook after you created it using the techniques laid out below. 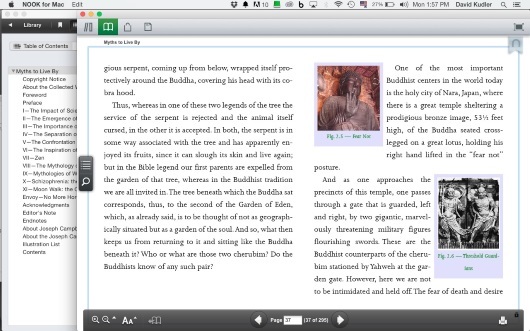 There are even apps that allow you to do this without un-ZIPping the file, so that you can see the ebook as you edit it. Every day I use two open-source apps (Sigil and Calibre) to refine ebooks that I’ve generated. The last two are particularly helpful if you are also preparing a book for print publication. There are many more options — including add-ons and plug-ins to existing commercial and open-source apps. All of these will create ePub files that work, and that should be accepted by most retailers. What’s the downside? Well, there are a couple of things. First of all, none of the files created by these apps will display quite the way that you expect them to in various ereaders, especially if you’ve got an ebook that’s got any complicated formatting such as drop-caps, tables, inset images, fancy typography, etc. The apps will try to reproduce on the screen what you were trying to create for the printed page, but often the style rules that the apps try to create make an incredible mess in one or more ereader. 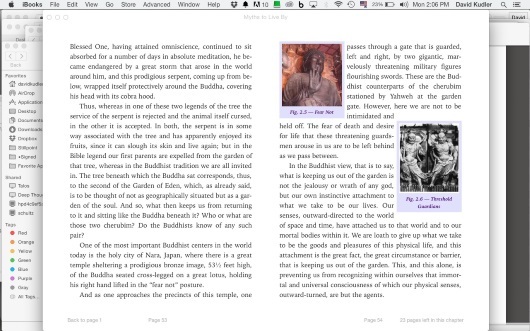 Everything may display as plain text on a Nook, while small images may fill the page on an old Kindle, while no images display at all on the Kindle app on your computer. Most of us start with a manuscript — a Microsoft Word, ODF (OpenOffice Document File), or RTF (Rich Text Format) doc that we’re looking to turn into an ebook. Now, as I said last month, a Word doc isn’t an ebook. But you can format the text and even insert images, hyperlinks and the other paraphernalia that make up an ebook, and then use an app to convert the document into ePub format. There are many, many such apps, both open-source and commercial, but I’ll only bother telling you about one that I’ve already mentioned: Calibre. Calibre was created to convert between an impressive variety of ebook and manuscript formats, including HTML, RTF, DOCX, mobi, AZW3, and, of course, ePub. It has a number of controls that allow you to fine-tune the conversion — but if you’re document’s simple, the standard settings will probably do. And of course, as I mentioned above, Calibre contains a WYSIWYG ebook editor that allows you to clean up your ePub file after the conversion. There are also a number of ways to upload a Word document and get an ePub file. (Most of them fall under the paid conversion option, which comes below.) Many of the retailers allow you to upload a Word document directly. Smashwords actually prefers Word docs — and will allow you to download your converted file in ePub format after they’ve run it through their famous “Meat Grinder” conversion tool (it’s actually a customized version of the software at the heart of Calibre). Amazon’s Kindle Direct Publishing does a pretty good job of converting simple Word files. 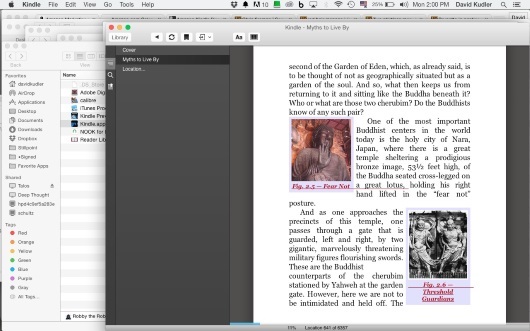 Kobo’s Writing Life and Barnes and Nobles’ Nook Press have online ebook editing tools. The downside here is the same as in Option #2 — the conversions are rarely perfect. And in most cases, there’s little that you can do about it, since the conversion is automated, and handled completely by the retailer. If you go this route, it is essential that you check your ebook out, not just on the retailer’s “preview” or “Look Inside” widget, but on an actual ereader. A quick disclaimer here: I’m an ebook designer, so I’m a bit biased toward this option. Still, I know it’s not the option for everyone. You’ve got complex design elements (tables, lots of images, sidebars, endnotes, drop capitals, etc.) that will require special care. You want to add a read-aloud track, video, or other enhancements. Your book contains non-Latin characters. You’ve got complex chapter headers. You want the ebook to look good, whatever device it’s read on, and you don’t want to spend the time learning how to make that happen. The idea of looking at HTML makes you break out in hives. Next time, I’m going to talk about how to prepare your manuscript for conversion — whether by you or by someone else. There are a huge number of factors that go into the cost of a conversion, from the state of the book (digitized? format?) to its complexity (footnotes/endnotes? tables? number of images? relationship of images to text? sidebars?) to any desired enhancements (audio/read-aloud? video? animation? scripting/widgets?) that giving a range of costs would be a bit meaningless. I’ve charged as little as $50 for a straightforward conversion to around $2,000 for a children’s picture book with animation, a read-aloud track (recorded by me) and a bunch of custom scripting. There are folks who charge more and some who charge less. I didn’t feel as if I could give a meaningful range. If you’d like to get a sense of the costs involved, you could check out Joel’s site ebookconversiondirectory.com. Some of the entries are out of date, but it’ll give you a sense of the range of services and costs. And it’ll offer a few hundred possible services — including mine.